DisplayStar's WindPro Hurricane banner pole hardware is the toughest street pole banner hardware available. Live in a windy area? Then these light pole brackets will be the best choice for you. 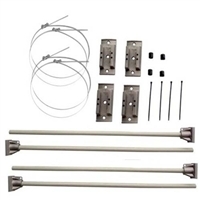 Our Hurricane pole banner bracket kits withstand up to 70 mile per hour winds with a banner up to twenty square feet. The durable, heavy aluminum construction coupled with the flexible fiberglass rod, allows the pole banner to stay intact without ripping tearing. These are perfect for any parade, fair, farmers market, marathon, business or city event. For a wide selection of custom or predesigned street pole banners click here or call 1-866-864-2831.